Beans truly are the magical fruit. What is your favorite bean? Have you ever tried butter beans? They are a game changer. Fresh is best but canned are tasty, too. Now let’s talk about faro. Similar to kamut or bulgur wheat, farro makes a good alternative grain. It does contain gluten, however it contains lower levels than today’s wheat, and if prepared properly, the gluten is pre-digested and broken down by sprouting and fermentation like a sourdough process. This makes it much more tolerable with anyone sensitive to gluten. Still not convinced? Try my simple Vegan Farro & Butter Beans with Kale dish for dinner tonight. Even better -Farro is an excellent source of protein, fiber and nutrients like magnesium and iron; it’s a big step up from using white rice or other refined grains in your favorite dishes. The kale in this dish is raw which adds a variety of texture and of course a handful of vital nutrients. Marinated first in lemon juice and olive oil helps break the kale down and makes it more palatable. Cooked so simply, this Farro and Butter Beans recipe is so flavorful yet has no additional spices. It’s incredible how flavorful vegetables are; they don’t need to coated in sauces or tons of spices. This Farro & Butter Beans with Kale recipes is hearty, warm, full of flavor, fiber, protein, and a bunch of micro nutrients. You can’t go wrong with this dish. garnish: chopped chives or mint, parmesan cheese. In a saucepan heat the dry farro and water until it boils. Let boil for 5 minutes. Turn down the heat, cover and let simmer for 50-60 minutes. In the meantime, cook the onion in a frying pan with 1 Tbsp olive oil or butter and a pinch of sea salt. Cook until translucent and then cook a little longer until caramelized and browned. This might take 6-8 minutes. Keep tossing and scraping. Add a bit more oil if necessary. In a medium sized bowl combine chopped kale, 1/2 lemon juice and 1 tsp olive oil. Using your hands massage the kale really well. Let it sit for about 5-10 minutes. Once the onions are nice and caramelized, add the onion powder, chili flakes, butter beans, another Tablespoon of olive oil and a pinch more sea salt. Mix well and heat until beans are warm. When the farro is done cooking you may need to discard any excess water. Farro shouldn’t be rubbery it should be soft and well cooked. Add farro to the beans and onion mixture. Add a few pinches of sea salt and a few teaspoons of olive oil or butter. Add the kale to the farro and beans. Toss well. Taste it to be sure you have enough salt. Garnish with fresh herbs and vegan cheese (optional). Posted in Dinner, Lunch, Side Dish | Appetizer, Vegan Food and tagged with farro, grains, dinner recipe, vegan dinner ideas, vegan dinner, dairy free. March 11, 2019 by Juli Novotny. This warm quinoa salad with ginger glazed carrots and onions will knock your socks off. This quinoa dish recipe has a bit of heat, a bit of sweet and a lot of savory. There’s crunch, nuttiness and fresh greens to add a punch of added health benefits. Have you seen the show Grace and Frankie yet? If not, you should. It’s a real kick. I watched one entire season with my mom. We would get together a few times a month and binge watch together. Then I got hooked and watched the rest of the season’s myself. Anyways, the new season is out and I’m really excited to sit by the fire tonight, eat this Warm Quinoa salad and sip a glass of wine. Who’s with me? This is a great on-the-go lunch as well. Store it in the fridge in containers that you can quickly grab and take to work, the park or in the car for post-gym. Speaking of the gym, I’ve spent a year working on building muscle mass and getting lean. It’s been so rewarding. Do any of you guys workout? Let me know in the comments. I share some of my workout milestones on Instagram, incase you don’t follow along, check out my handstands progress here. On another side note, while making this warm quinoa salad, I accidentally erased my photos of the maple ginger glazed carrots and onions. I am so stupid and super bummed because it shows them before and after while cooking. Darn it! Oh well, hopefully you get the idea. The kale should be prepped ahead like the image above. Be sure to add oil and lemon and massage it really well before adding it to your warm quinoa. This will help with digestion and make it more palatable. I love this salad and have made it many times for pot lucks and dinner parties. It’s a great side dish or makes a really well balance main dish as well. People love the mixture of savory, with sweet and spicy plus all the different textures. It’s healthy and delicious, what more could you ask for? In a sauce pan add water and quinoa. Bring to the boil. Then cover with a lid and simmer for 20 minutes. While it’s cooking, add 1 Tbsp olive oil to a frying pan and add the chopped onion and minced garlic. Cook until onion is translucent. Add 1 tsp sesame oil, 1 tsp olive oil, tamari, freshly grated ginger, honey or maple syrup, sea salt and chili flakes. Immediately add the chopped carrots. Cook until carrots are soft, about 10 additional minutes. They will start to blacken if you let them cook on medium. Using a metal spatula scrape bottom of the pan and keep cooking until caramelized. About 5-10 more minutes. Don’t let them burn. When quinoa is finished cooking, add 1/2 tsp olive oil and pinch of sea salt. Stir until fluffy. In a separate bowl add chopped kale, squeeze of lemon juice and 1/2 tsp olive oil. Using your hands massage the kale really well and let sit for a minute or two. Combine the quinoa with the caramelized carrots. Stir well. Add the kale mixture and toss again. Serve warm. Top with chopped fresh mint or cilantro, toasted sesame seeds or chopped toasted almonds or pecans. Posted in Dinner, Lunch, Salad, Side Dish | Appetizer, Thanksgiving, Vegan Food and tagged with dinner, side dish, quinoa, glutenfree, vegan dinner, carrots, ginger carrots, kale salad, Warm ginger glazed carrot quinoa salad. February 22, 2019 by Juli Novotny. These cute little Easter Muffins are really easy to make, taste fluffy, moist and perfectly sweet. Top with frosting and you have super healthy cupcakes. Free from eggs, nuts, gluten, dairy and cane sugar they are perfect for pretty much any kid. Plus, and most importantly, they pass the taste test. Because these chocolate banana muffins are so easy to make, the kids can participate. Mine are topped with Trader Joes Chocolate Covered Sunflower seeds, but you can top them with any fun candy or even plain chocolate chips. They make breakfast on-the-go festive for April or any month out of the year. This recipe was adapted from Two Peas and Their Pod. She’s got some really fun recipes, if you wan’t checked them out, you really should. It’s a very moist, delicious allergen-free banana bread recipe. The chocolate addition is great for those that want chocolate in/on everything. 3/4 cup vegan chocolate chips and 1/2 cup Trader Joes candy coated chocolate covered sunflower seeds. Heat your oven to 350°F. Grease muffin tin. In a small bowl, mix together the flax seed meal and water. Let sit for 10 minutes. In a medium bowl, whisk together the flour, cocoa powder, baking soda, and sea salt. Set aside. In a standing mixer bowl, combine the ripe bananas, melted coconut oil, agave (maple syrup) and beat until combined. Add in the coconut sugar, flaxseed mixture, and vanilla extract. Mix until smooth. Add the dry ingredients into the wet ingredients, and mix again on medium until well combined. Stir in 1/2 cup of the chocolate chips. Pour batter into prepared muffin tin. Sprinkle the remaining 1/4 cup of chocolate chips over the top of each muffin. Bake for 45 minutes. Let sit 15 minutes then remove muffins from pan and set on wire cooling rack. Serve warm. Posted in Breakfast, Dessert, Gluten-Free Baking, Kids Foods And Drink, recipe makeover, Vegan Food and tagged with breakfast, chocolate muffins, muffins, vegan muffins, chocolate chips, dessert, kids dessert, kids snack. February 19, 2019 by Juli Novotny. Are you craving creamy ranch dressing but don’t want the dairy or the other artificial ingredients that the big Kraft bottle contains? Well, if so, I have good news for you: you can make it from scratch at home and it’s delicious. 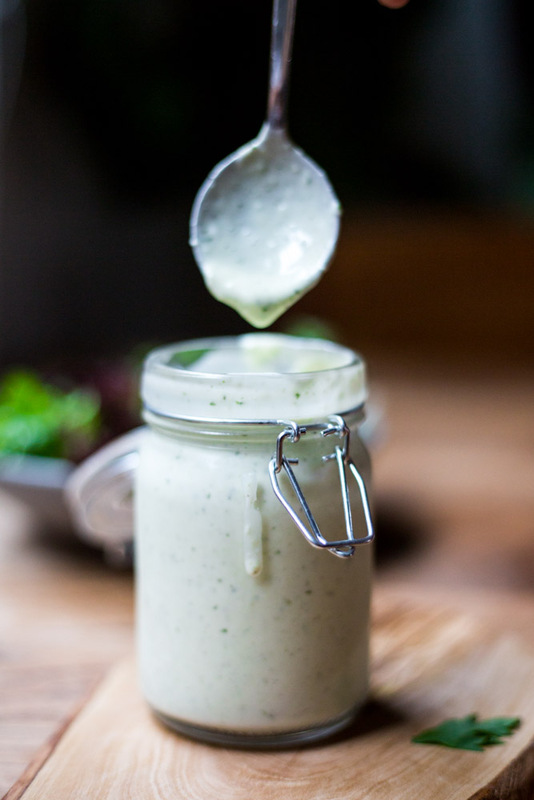 My vegan dairy-free ranch dressing recipe is creamy, flavorful and perfect for salads or even dipping pizza. This ranch dressing recipe is so simple, easy, tasty and delicious; you won’t even miss the dairy. I promise. It’s full of healthy, superfoods and the perfect amount of salty savory sour pizazz. You can’t go wrong. 1. Place all INGREDIENTS into a high speed blender and blend on medium for about 20 seconds. Then high for a quick 5 seconds. Everything should be blended evenly and thoroughly. Posted in Condiments, Raw Vegan, recipe makeover and tagged with salad dressing, vegan dressing, vegan dip, vegan ranch dressing, ranch dressing, dairy-free dressing, dairy-free sauce. February 11, 2019 by Juli Novotny. Hey everybody, it’s been awhile. I’ve been caught in a Mom rut lately but I’m back and ready with a few of my favorite recipes as of late. Have you guys had JUST eggs yet? Never heard of it? The makers of JUST mayo created an egg scramble batter that looks and tastes just like eggs. It’s made from none of there than mung beans! I have made it way too many times; my kids are sick of scrambled eggs and omelets right now. Today we did burritos. 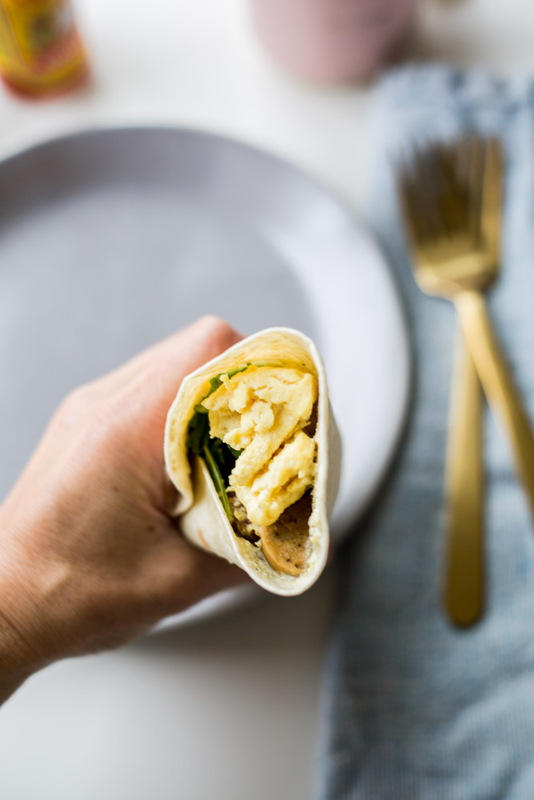 Super simple, super easy, protein filled sausage and egg breakfast burritos. And the kimchi mayo sauce is magic, one of my favorites right now. Add a dash of Chulula and you’re golden. We added some garlic sauce, but you could swap for Veganaise and cheese of your choice. The tortilla is key - go gluten-free or whole wheat, it’s your choice. But the softer the better so it hold together well. Add some spinach or arugula for added fiber and nutrition. We love the Field Roast apple smoked sausages right now, so we added those too. It’s ridiculously filling and full of plant-based protein. This could be lunch or dinner as well. No need to limit yourself to breakfast. You’ll be so glad you made these, go for it! Let me know what you think…message me or post your own photos on Instagram. Heat the earth balance on a skillet. Once it’s liquid, add Just eggs. Let it cook, don’t add salt or cheese. Just cook it until firm, not liquid. Add sausage and cook longer until sausages are warm. Turn off heat. On a microwave safe plate layer tortilla with cheese and mayo sauce (recipe below). Warm tortilla for about 30 seconds. Add greens of choice. Then add the eggs and sausage mixture. Quickly wrap the burrito up. Enjoy while hot. Top with sriracha or Chulula hot sauce if desired. In a small dish mix the above ingredients thoroughly with a fork or spoon. Posted in Breakfast, Meat Alternative, recipe makeover, Sauces, Vegan Food, Vegan Sauce and tagged with breakfast, savory breakfast, burrito, eggs, vegan breakfast, breakfast wrap. February 9, 2019 by Juli Novotny.